Last Easter, I shared with you my Easter Egg collection. I try to make a few handcrafted Easter Eggs every year. I like to try new techniques and I save them. I have a growing eclectic collection of decorated eggs. But, in all the years I have been hand-blowing and decorating them, you'd think I would have dealt with the remaining blow holes in a better way. The holes certainly mar the appearance and, although often tiny, appear gaping because they are so visually distracting. This year I decided to tackle the question and the solution was so obvious I am embarrassed to say it never crossed my mind before. Start with a collection of hand-blown eggs. 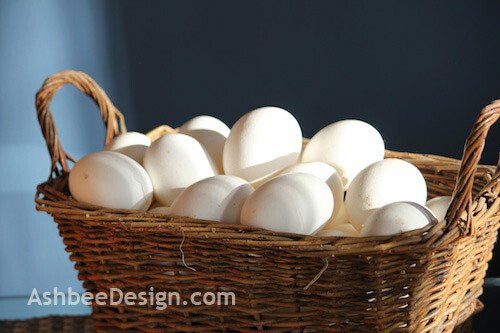 We don't eat a lot of eggs here on Ashbee Hill so I collect them all year long. They are beautiful just as a collection even during the none Easter season. I keep a basket of them on the shelf. If you want more information on blowing eggs just do a Google search. There are many tutorials online. Here is a link to one. Each egg has two holes, one at each end and after decorating, it is ugly. Just get a small container of drywall Spackle. I had some DAP on hand. 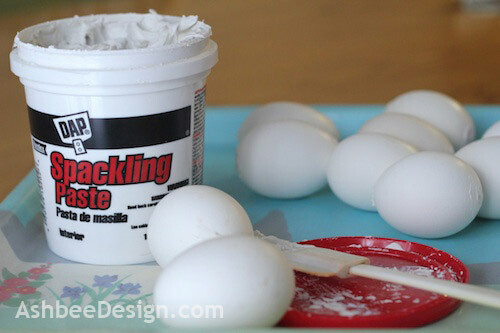 Using a rubber kitchen spatula smush some spackle into the holes. Try not to leave huge globs of it on the outside but you don't have to be super fussy either. The excess is easy to remove once dried. Let the spackle dry. On the first coat I waited overnight. 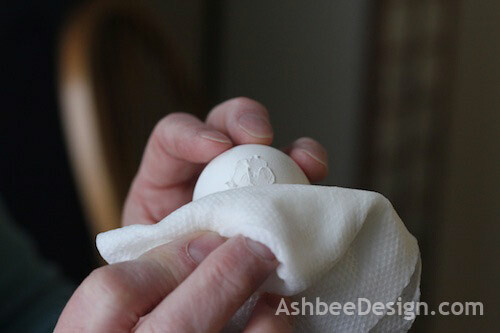 Take a damp paper towel and rub off the excess. It is easy to remove. Add a second coat and repeat. On some holes I added a third coat. The actual filing of holes took very little time. 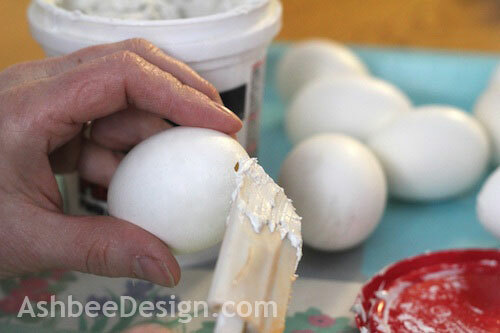 Waiting between coats took a lot longer so plan to do this in advance of your egg decorating. Result: A hollow egg with no holes! Ready for decorating. Tomorrow I'll show you my 2012 egg design. Think ombre color. Link to see the Ombre Easter Egg Tutorial. I've been storing in to-be Easter Eggs... until I have all I need (I'm going to use them as markers for Easter Sunday Family Lunch) we can only have scrambled eggs ahahahah. But I'll have to paint mine in white - as they aren't (it's very difficult to find them in white in my Country, it seems) - as I'm going to write the names and a sentence related to Easter (tbd) in black. This is brilliant! 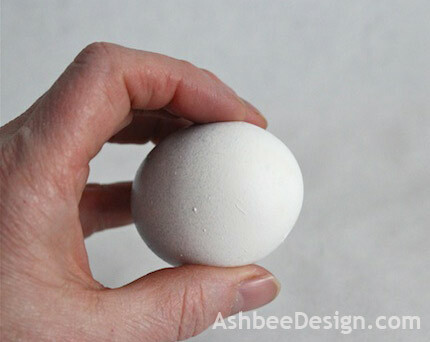 I have blown out eggs for years, but never thought of filling in the holes. Love it!